Background: Plant organ growth and development are determined by the subtle balance between growth stimulation and inhibition. Fruit size and shape are important quality traits influencing yield and market value. Cucurbits are a large and diverse plant family that supplies many important fruits. Cucurbit fruits develop from inferior ovaries and are known for their extreme diversity in size and shape—ranging from small to giant, and from oblate to elongate. However, the underlying mechanism regulating the balance of fruit growth to achieve final fruit size and shape is not well understood. Question: What is the genetic and molecular basis for regulating the balance between cucumber (Cucumis sativus) fruit growth stimulation and inhibition? Findings: This study explicitly tested the hypothesis that plant cell division planes mimic weightless Using two shortened fruit mutants, sf1, which exhibits reduced cell division and overproduces ethylene, and acs2, which exhibits reduced cell division but produces relatively little ethylene, we revealed the genetic and molecular mechanism controlling ethylene dosage for cucumber fruit elongation. We demonstrated the effects of different ethylene dosages on fruit elongation using ethylene gas as a direct ethylene treatment, providing major insight into the molecular basis of cucurbit fruit morphogenesis. Our findings may also provide a potentially useful method for generating a series of fruits with a gradient of lengths via physiological treatment or genome editing methods. 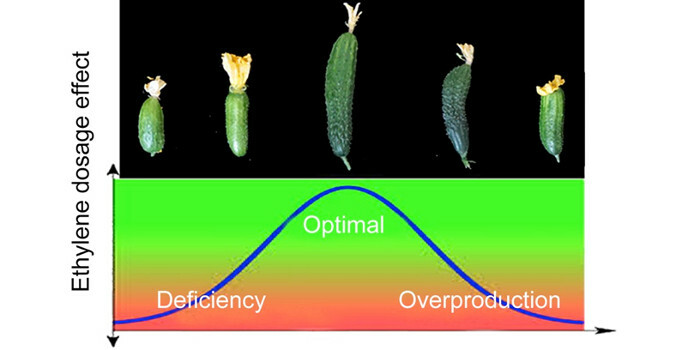 Because fruit size preferences vary among consumer populations, this research could guide cucumber breeding practices. 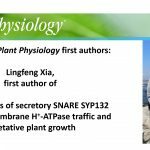 Next steps: How do dose-dependent ethylene responses exert multiple roles in fruit cell division? Although the biphasic ethylene response model was proposed, the mechanistic basis for this diversification remains speculative. Cucumber fruit constitutes a potential important system for unravelling the signal transduction components involved in the different ethylene responses.